We’d love your help. 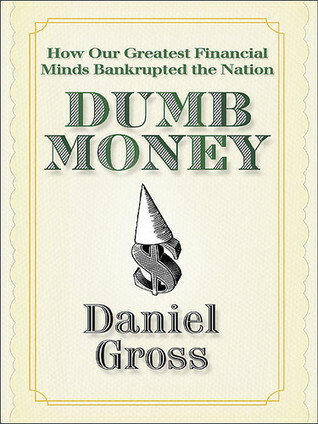 Let us know what’s wrong with this preview of Dumb Money by Daniel Gross. The financial crisis that has gripped this country since last September has had so many twists and turns, it would make for a great drama -- if it all were not so real and damaging. Companies are shutting down and laying off workers, 401ks are melting away, and the government is spending $700 billion dollars to bail out banks and financial institutions -- and that's only t The financial crisis that has gripped this country since last September has had so many twists and turns, it would make for a great drama -- if it all were not so real and damaging. Companies are shutting down and laying off workers, 401ks are melting away, and the government is spending $700 billion dollars to bail out banks and financial institutions -- and that's only the beginning. The financial services industry, and the many industries that depend on it -- from housing to cars -- is in intensive care. To ask other readers questions about Dumb Money, please sign up. I know everyone out there is trying to affix blame. It's so much more fun than actually taking the problem apart and trying to fix what was wrong. The fact is that many minds, much smarter than mine, many of them "knowing" they were smarter than the rest of us, were busily, if unwittingly, bringing down the financial system, and making lots and lots of money. John Kenneth Galbraith said something like, "when the facts change, I change my mind." The mantra of the past decade was that if the facts I know everyone out there is trying to affix blame. It's so much more fun than actually taking the problem apart and trying to fix what was wrong. The fact is that many minds, much smarter than mine, many of them "knowing" they were smarter than the rest of us, were busily, if unwittingly, bringing down the financial system, and making lots and lots of money. John Kenneth Galbraith said something like, "when the facts change, I change my mind." The mantra of the past decade was that if the facts don't fit, change the theories and the rules. 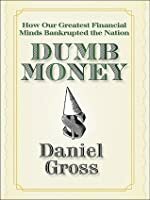 Cheap money was part of the problem, but so were prognosticators predicting a 36,000 Dow, the ownership society that dissolved into an investment society, people who bought homes as investments not places to live, and shadow-banks who, after running out of good mortgage candidates, went after the not so good. The fact is that by 2005 some 70% of families in the United States owned their own home. That left virtally no one left to get into a house. So they went after those who couldn;t asfford one. But another problem was that 23% of homes were investment properties. People had fallen prey to the perceived wisdom of the experts who predicted $4 million homes in the suburbs. Since brokers and banks needed fees to survive, they were soon converting mortgage owners who could no longer pay the mortgage from a thirty year fixed to a forty year, then an ARM, then option ARMs. Risk was not relevant because they were securitized; everything depended entirely on housing prices always going up. The author saw an ad in the Wall Street Journal for a reverse amortization loan up to $5 million. That's insane, buit no one was willing to say the emperor was naked. Those who dared make the suggestion were soon gone. Because of the way hedge fund and financial managers were compensated, the income was considered a capital gain so it was taxed at 15% instead of 36%. The incentives to sell more mortgages, refinance, resell, buy, buy, rate highly were insurmountable. People at the top were making just hoards of money. Some blame the CRA but the fact is that the Community Reinvestment Act is 30 years old. It was created to prevent banks from redlining, i.e. not making loans based on location rather than income. Subprime mortgages didn't even exist until about 3 years ago when Greenspan and the Fed loosened up money and made it really cheap (this is a Randian libertarian idea.) Even Greenspan has now said this was a mistake that was a primary factor in the crisis. Sub-prime loans, in and of themselves, would not have been a problem had financial wizards not invented credit default swaps and collateral debt obligations that virtually, by securitizing and packaging all sorts of debts together, eliminated all risk. These CDO's and CDS's were rated AAA by the rating agencies without any real idea what the risk attached to them was. Technology was supposed to provide the information needed to keep everything transparent. But then again, the same thing was said of the telegraph. The fact is that sub-prime loans were hugely profitable for lending and mortgage companies (note that only a very few banks were involved in these loans except as they were the owners of the mortgage companies.) They were making money off fees and because the loans were sub-prime they could charge higher interest rates. They were hugely profitable; just look at the balance sheets before it all came apart. Fannie and Freddie went wrong by insuring the loans, but again, they couldn't see the risk and the CDO's and CDS's were rated AAA. Both political parties share the blame. The Republicans, had they been worried about Freddie, Fannie or any other systemic problem had ample opportunity between 2000 and 2006 to do whatever they wanted since they controlled the White House and both houses of Congress. The fact is that the "ownership society" was a big goal of the Bush administration. That meant encouraging people to buy homes. The Democrats should have done something too. No question. And a lot of the people involved in creating the problem we now expect to fix it: Paulson, Geithner, etc. Unfortunately, the climate of cable TV pundits, having to fill up 24 hrs of "news" spend all their time trivializing and playing the blame game, a process that only makes things worse and people angry. Doesn't remotely help solve the problem. Succinct, but pithy. Recommended to everyone. If you read nothing else, I recommend the conclusion. His recommendations make a lot of sense and should be read by everyone in Congress. As Gross said, “The economy rested on four pillars: perpetually low rates, perpetually rising asset prices, borrowers remaining current on payment, and strong markets for packaging and trading debts.” So when the pillar trembles, domino effect takes hold. The layers of debt triggers from mortgage to MBS (mortgage-backed securities) to CDO (collateralized debt obligations) to CDS (credit default swaps). Our financial plague was not a result of fudged numbers on financial statements. It was the res As Gross said, “The economy rested on four pillars: perpetually low rates, perpetually rising asset prices, borrowers remaining current on payment, and strong markets for packaging and trading debts.” So when the pillar trembles, domino effect takes hold. The layers of debt triggers from mortgage to MBS (mortgage-backed securities) to CDO (collateralized debt obligations) to CDS (credit default swaps). Our financial plague was not a result of fudged numbers on financial statements. It was the result of creative financial instruments and the change of rules by SEC and other intellects. It is noteworthy that Fannie Mae, Freddie Mac themselves pioneered the securitization of mortgage. They knowingly (or unknowingly, depends on your perspective) distribute risks from local loans to financial institutions around the world. On top of that, our federal government volunteered and backed them up when the subprime loans, Alt-A (low documentation) loans, and leverage loans gone haywire. We are rewarded with, for a lack of better term, a double-kick in the stomach. With the benefit of hindsight, Gross explained the intricacies among debts and our financial structure. There is a lot to absorb and I truly enjoy reading this book. I only wish he had provided an index as I found myself lost in acronyms at times. In any case, I highly recommended this book. Obviously rushed to press, the book is nonetheless well-finished. Many of the chapters are extended reprints of Mr. Gross's articles for Slate.com...as such they can be read separately to great effect. Overall, one of the best books/primers on WHAT HAPPENED to our economy. And BTW, the author points fingers...effectively... at NYC and Wash DC. Yikes. One of the smarter current event reads and won't go out of style soon. Oh, and it is a quick read. A great way to get smarter in one weekend! Daniel Gross presents a pretty clear analysis of what happened and why. He definitely calls out the heavy hitters whose policies and practices led to our current economic state. However, the books is a bit insider-y with many metaphors to describe what was happening that only confused me more than illustrated anything. This book was definitely written for people who already have knowledge of markets and monetary decision making. Interesting, insightful and short. But not too short. It is just nice to have a finance book that explains things in a concise and easy to understand way. If you wonder WTF happened in the last year, his first chapter (WTF) explains it. You should all read this book, it is only 101 pages. I easily finished it in a night. Nice step by step summation of why we are in the current economic crisis. 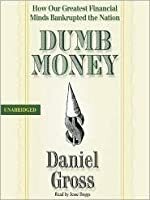 Pieces together all the parts of why easy money became bad money with one default after another. Just as a hint, the perfect storm was brewing for quite awhile. Good informational book. Quick read but boring. No story at all but decent general information. This is one of several books I ordered before I became obsessed with a good story. I like Daniel Gross, although I don't remember this that much, I enjoyed it at the time. A look at the housing bubble and the recession that followed. It broke down how the cheap money led to some dumb money and then dumber money. Very interesting ideas. Every stock "trader" should read this book. Though I've never been a day trader, I personally think day trading is a fool's game. This is a book about a fool's lifestyle.